Sustainability has become a buzz-word in contemporary thought. In simple terms, sustainability means, according to present understanding, to attune our human life with the laws of Nature in such a way that it leads to our sustainable economic development. However we need a deeper and broader understanding of sustainability based on a better understanding of Man and Nature. Here comes the role of spirituality and the spiritual vision of ancient and modern seers in steering our sustainable development. According to this spiritual vision neither man nor Nature is entirely physical. Our human organism is multi-dimensional, made of our physical, psychological and spiritual energies, which are in turn derived from corresponding dimensions in universal Nature or in other words, for our sustainable evolution we need a greater ecology which can help us to attune our outer life not only with the laws of outer physical Nature but also to synchronise our inner being with the laws of the psychological and spiritual dimensions of Nature. This cannot be done entirely by the scientific and rational mind. We must have the spiritual intuition of the seer and the sage. If we don’t have it, we have to draw upon the spiritual wisdom of the past and the present seers, and based on it, use our scientific, rational and pragmatic mind to arrive at a feasible framework of thought and practice. Here comes the importance of the ethical and spiritual principles and practices discovered by the spiritual traditions of the world, especially the Indian spirituality, and the great science of yoga. What are modern ecological practices like recycling to our physical sustainability, the path of yoga is to our psychological and spiritual sustainability. In this spiritual perspective, we have to replace the term “sustainable development” by the term “sustainable evolution”. In modern thought, the term “development” is associated with economic and social development. But economic and social development, even when it is pursued with ecological principles, are not sufficient to steer the evolution of our human race and our planet to our higher and future destiny. The prophetic insights of evolutionary thinkers like Sri Aurobindo and Teilhard de Chardin indicate that the future evolution of our race lies not in the material, economic or even the ecological domain but in the moral, psychological and spiritual realms. This requires a rethinking of the aims of development, which is already happening. This means priorities of sustainable development has to shift from material, economic and ecological sustainability to psychological and spiritual sustainability. This requires a human development and organisational strategy based on the principles of yoga. But there is much misunderstanding on the meaning of yoga. The popular understanding of yoga tends to equate yoga with the Asanas of Hatha yoga, but the asanas are a very secondary and physical aspect of yoga. The true meaning and principle of yoga may be described as “growth of conscious through accelerated inner evolution”. Yoga speeds up the inner progress of the individual through a focussed concentration of the psychological energies in the human being. The principles of yoga can also be applied to the inner development of the collective, which has not been done so far in the history of humanity, but it can be an important part of the evolutionary experiments of the future. As we grow in consciousness through the path of yoga, one day we will rediscover the greatest ecological principle discovered by Indian seers- Unity of life and Oneness of all existence. Modern science has discovered this unity in the form of connectedness and interdependence of things at the physical level- new physics at the subatomic level and modern ecology at the biological or macro level in physical Nature. Indian seers perceived this in its essence as a Unity of Consciousness pervading all the levels of creation- physical, vital, mental and spiritual. In our individual human organism we can feel this unity in our own highest self beyond our mind, where we can experience all others and all creation as part of our own self, as concretely as we feel our body as our own self. This is our highest spiritual destiny and to make our whole life and every activity of our life into a conscious and progressive journey towards this Unity of Consciousness is the aim of yoga and the path of evolutionary sustainability. In this spiritual perspective corporate social responsibility has to be based on this perception of the Unity of Consciousness and the connectedness and interdependence of all life. In practical terms, it means our well-being is dependent on the well – being of all others and the well-being of the larger whole of life. An act of goodness which brings wellness to others returns upon me enhancing my own wellness because I am one with all others. Similarly an act of exploitation or violence also returns upon me with painful consequences. The other aspect of corporate responsibility is towards the people who work in the organisation. A company which looks towards the future has to regard their higher evolution towards their Self of Unity as a part of their corporate responsibility and create an outer environment favourable to this evolution. E. F. Schumacher, ‘Small is Beautiful’. Pg 44- 52. Maurice Strong, ‘New Growth Model’, ed. Ritchie Calder ‘Future of a Troubled World’, Pg 141. Howdy! I know this is kind of off topic but I was wondering which blog platform are you using for this site? I’m getting sick and tired of WordPress because I’ve had issues with hackers and I’m looking at alternatives for another platform. I would be awesome if you could point me in the direction of a good platform. 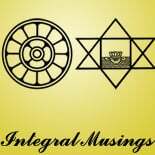 This entry was posted on September 6, 2017 by integralmusings in Integral Management.